Habitat: Various; from woodlands to grasslands and rural to urban. Lifespan: Up to 7yrs in the wild; 10 years in human care. Found on a driveway in Shingletown at only 3 weeks old, dehydrated and emaciated. During rehabilitation it was discovered she had a neurological problem. She came to Turtle Bay at 8 weeks old on 6/20/2013 and was raised by the trainers. 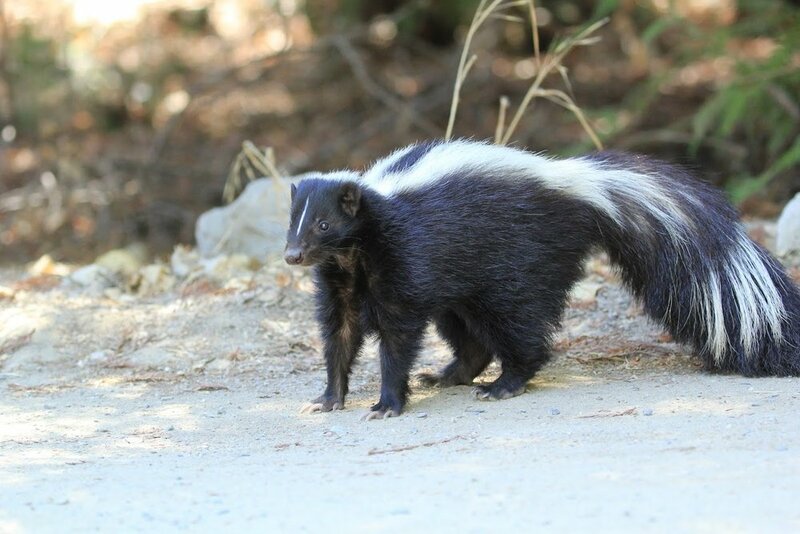 Skunks ignore most other animals but when threatened they will arch their back, stomp its feet, and back up while scraping the ground. If these signs are ignored, then the skunk will discharge its musky spray up to 14ft. Most animals recognize the black and white coloration and learn to stay away, however animals like the Great Horned Owl, which don’t have a good sense of smell, are a main predator of skunks. Skunks are solitary animals and are mainly crepuscular, becoming active at dawn and dusk. It is not uncommon to see them out during the day. Their long foreclaws are used for digging up food or occasionally digging their own dens. However, they often use other mammals’ abandoned dens or take advantage of hollowed logs or brush piles. Skunk musk is very oily and difficult to remove. Tomato juice does NOT work.